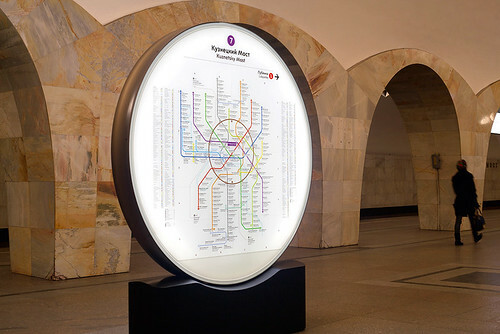 The evening features three entertainingly expert guests: Cal Jepps, senior designer at City ID (Moscow Metro, etc. ); Adam Dant, artist and map-maker extraordinaire; and Caroline Walker, great-niece of MacDonald (Max) Gill and co-curator of the current exhibition at the Ditchling Museum of Art and Craft. Right. 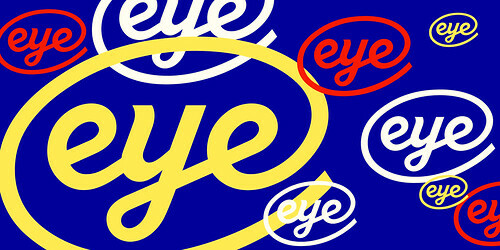 Banner for the next Type Tuesday designed by Esterson Associates. Top. 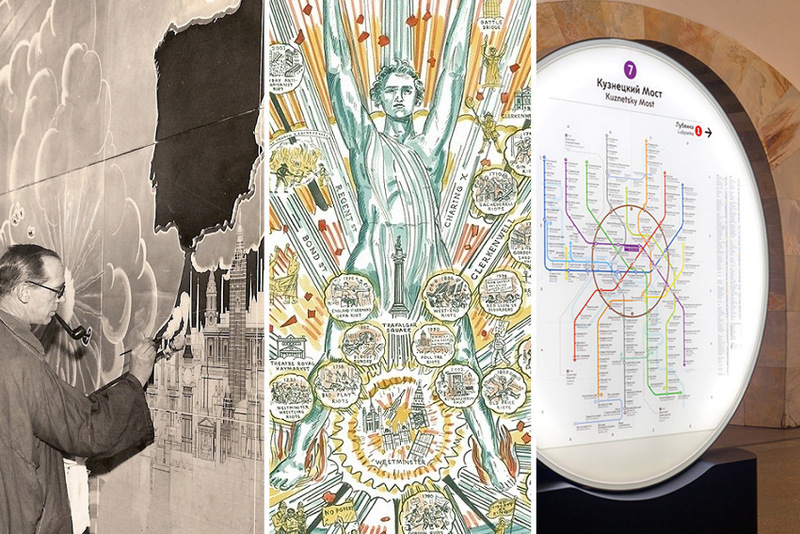 MacDonald ‘Max’ Gill at work on the RMS Queen Mary, a detail from Adam Dant’s map of London riots and some of City ID’s work for the Moscow Metro. We’ve been programming these regular events for the past five years to create a regular, sociable live event that is fun, informative and magazine-like, and we really appreciate your support – as does the St Bride Foundation, who get all the ticket money. Max Gill. Poster for the Tea Market Expansion Board, 1940. Max Gill. Brighton-born MacDonald (Max) Gill (1884-1947) is the subject of the exhibition ‘Max Gill: Wonderground Man’, currently running at Ditchling Museum of Art + Craft until 28 April 2019. Gill’s work, with its wit and distinctive Art Deco flourishes, charted the rise of his era’s new technologies. His Wonderground Map (1914) was hung at every London Underground station, and in 1917 he was appointed by the Imperial War Graves Commission to design the lettering used on the Cenotaph and every military headstone since the First World War. Gill made many more maps for London Underground and the Empire Marketing Board. Caroline Walker will give a comprehensive, illustrated account of Gill’s life and work, including many images and maps rarely seen since the 1940s. You can contact her via the official MacDonald Gill website, here. Adam Dant’s Maps of London & Beyond, published by Pavilion Books in conjuction with Spitalfields Life. Adam Dant, who originally trained as a graphic designer, studied at the Royal College of Art in London and at the MS University Faculty of Fine Arts, Baroda, India. He is perhaps best known for his eccentric, detailed illustrative maps of London and his witty caricatures of East Londoners. His work has appeared in the Ganzfeld, Tate, Etc., the Independent and his own legendary Donald Parsnips Daily Journal, and is exhibited at galleries worldwide. 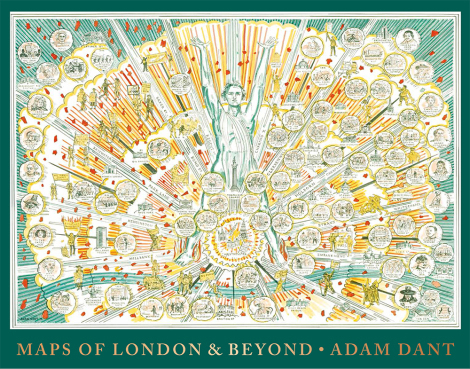 Dant’s latest book is Maps of London & Beyond (above), published by Pavilion Books in conjuction with Spitalfields Life, which includes the Gentle Author’s extensive interview with Dant. Cal Jepps, who has worked at City ID for six years, has been involved in projects across the globe – from Bristol and Birmingham to New York, Moscow, San Francisco and San José. 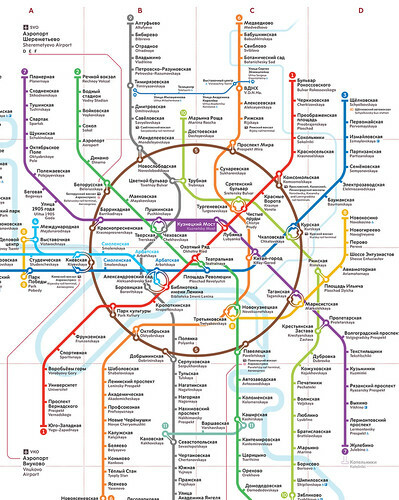 You can read about City ID’s work on the Moscow Metro with A2-Type in ‘Moscow by type’ in Eye 90. Cover of Eye 97. 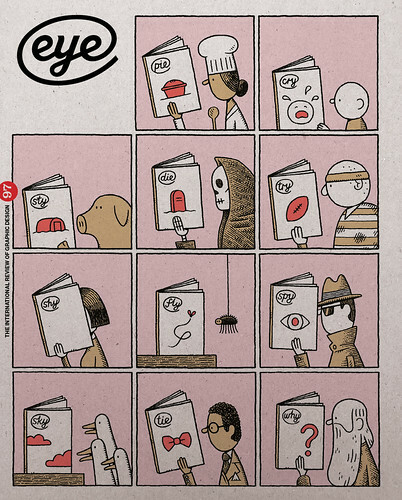 Illustration: Tom Gauld. Logo: Magnus Rakeng. Art director: Simon Esterson.